Iris Japonica, or Japanese Iris, is my dream foliage plant. I pull existing clumps gently to pieces and poke the separate bits straight back into the soil. They always grow, even with no watering to start them off. I like to use this plant for edging paths, and plant it right up to the rows of stones. 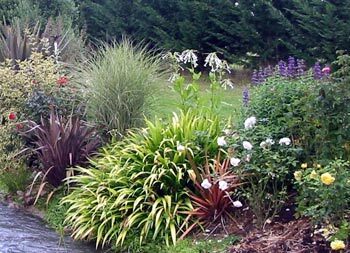 it grows equally well in sun or shade, and when it spreads too much I just pull the extras out. 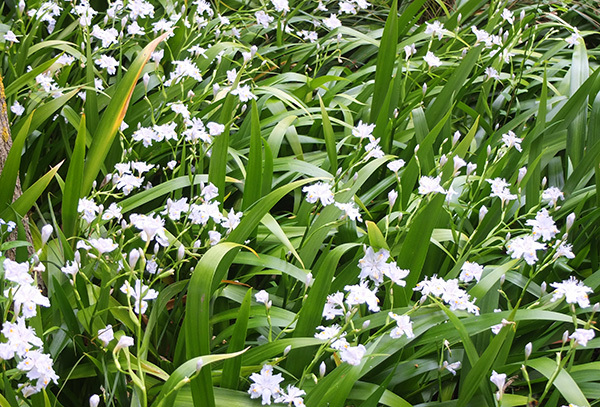 Iris Japonica has small bluey white iris shaped flowers in late spring, which are beautiful en masse. 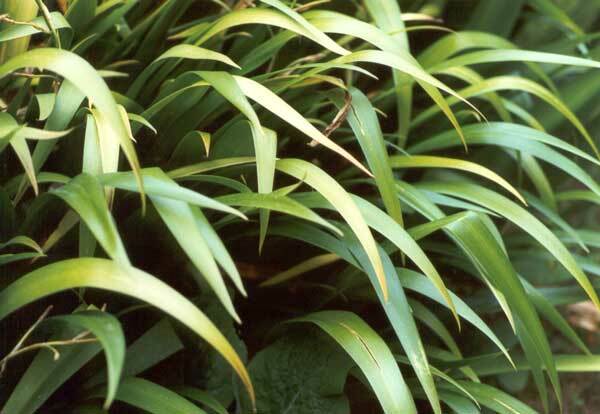 One failing of this plant is that after spring frosts it can stay looking very scruffy for many weeks into summer. And if there are winter snowstorms it gets totally flattened. We don't get many, but the Iris Japonica plants take forever to lift themselves back to being upright. Patches of the iris creep ever outwards, too, but they're easy to rip out. And new plants are easy to get started - almost at any time of the year. Finally after years of neglect I now have a picture of its icy white flowers. They appear in mid-spring, and usually at this time there is a riot of spring colour everywhere. These subtle white flowers are overlooked in favour of the Camellias, flowering purple honesty and of course the show-off yellow daffodils. Oddly I occasionally get very annoyed with this plant, and have been known to change my mind and completely clear it out of a garden area. I do make a habit of growing it along the edge of borders, though, so it's not easy to miss.